It’s not our job here today to try to sort out and answer all the questions about our identity that we may have. But what is our job today is to point to Jesus Christ and to say as clearly as we can – that it is only as we know ‘WHO JESUS CHRIST’ is, and that we are ‘IN CHRIST,’ that we can know who GOD SAYS WE ARE. And it is only when we know who GOD SAYS WE ARE – IN CHRIST – that our IDENTITY CRISIS can ever be resolved. 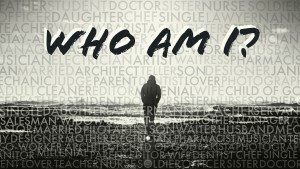 Either the Ephesians were having their own ‘identity crisis’ and Paul wants to show them who they are IN CHRIST, or he’s praising them for knowing who they are IN CHRIST, and we could stand to learn a lot from their example. There’s way more than we can cover in this text, but I want to highlight six points about our identity IN CHRIST as Paul writes about them here. It’s easy for us to get so wrapped up in the pursuit of all of the PHYSICAL BLESSINGS and to evaluate WHO WE ARE by how many PHYSICAL BLESSINGS we have or don’t have but would like to have, that we fail to take stock of the SPIRITUAL BLESSINGS that we do have IN CHRIST, and fail to realize WHO WE ARE. The Father has placed “every spiritual blessing” in His Son. These “spiritual blessings in the heavenly places” are all the things that Paul piles up, one on top of the other, in this run-on sentence and that provide the answer to the question, WHO AM I? How much of who we THINK WE ARE is based on whether we’re ‘chosen’ or ‘rejected’? Tremendous weight is placed on being ‘chosen’ – chosen by others to be a part of their ‘group,’ chosen by someone to be their friend, their spouse, their teammate, their co-worker. God chose you, not because He saw something in you, some goodness, or even some potential for goodness that attracted Him to you or that impressed Him. God chose you before the foundation of the world, and solely because of His love and grace and mercy THAT ARE IN JESUS CHRIST – and you are IN CHRIST. Who are you? You are someone who has “every spiritual blessing” – beginning with having been “chosen by God.” And that is primary. Whether or not you are chosen by others is secondary to WHO YOU ARE. III. Holy and Blameless before Him. How much of our identity do we base upon how much approval and acceptance we have before others? We strive to justify ourselves and gain approval from others – which can never be satisfied – and therefore we’re never satisfied with who we are. But the thing that determines my identity far more than the acceptance of others – is God’s acceptance of me. And He has declared you to be “holy and blameless before him.” We look in the mirror and “holy and blameless before Him,” is certainly not who we see. “That’s NOT who I am,” we say. But God sees us IN CHRIST – who is ‘holy and blameless before Him.” He says, ‘don’t believe your eyes – the way you see yourself. And don’t believe your ears – the things that others say about you. Believe My Word – you are IN MY SON. When I look at you, all I see is Him – who is holy and blameless before Me. Because we don’t know who we are IN CHRIST, we’re restless people – and our restlessness becomes a part of our identity. We’re not sure what our future holds. And we’re even less sure how to control the present in order to get the future we want to have. And so we work harder and harder to try to secure a secure future for ourselves. And then something happens. Something doesn’t go as planned and the future is no longer what we had planned we’re disappointed and sometimes broken. And suddenly we don’t know WHO WE ARE. But “in love, God has predestined us for adoption as sons (and daughters) through Jesus Christ…” Just think about that. God already has your future all worked out in His Son, Jesus. That’s what PREDESTINED means, and this is why PREDESTINATION is such a comforting doctrine. You have a DESTINY that already set by God – in love – before you were conceived. Who are you? You are His child. He is your Father. You are a child of God. Because we don’t know who we are IN CHRIST, we’re very tired people – we’re always tired and weary – if not physically then emotionally and spiritually. Many things can make us ‘weary,’ but the one burden that we all carry that wears us out is GUILT – guilt for our sins and our failures to meet the expectations of God and our loved ones and friends and neighbors and co-workers. Guilt is a powerful factor in shaping our IDENTITY. Because we don’t know who we are, we get so confused about why things happen the way that they do and why things don’t happen the way that we think that they should. We so easily fall into the trap of trying to interpret God’s will for us in the things that happen or don’t happen to us – and this shapes our identity. Like little children, we may not FULLY understand how all of the parts and pieces of the mystery fit together. But this much we do know – THEY DO – and that His good and gracious will, will be done, on earth as it is in heaven. And so our identity is not shaped or determined by the ‘chances and changes’ of life – but by the simple trust that God is working all things for good to those who love Him. I hope you get the idea from just this much which is not even the whole sentence, that our identity crisis has been solved IN CHRIST. Don’t ever let it be said of you, ‘he never knew who he was.’ You know who you are IN CHRIST. And that should have a profound effect upon who you are IN THIS WORLD.